Whew - what a weekend! As I’ve mentioned in previous posts, we are getting our house ready to sell, which if you are a fan of or have ever watched any the real-estate shows on HGTV, means a lot of work! I’ve been asking myself all weekend: Why did I buy this? What was I thinking? Why did I keep pay stubs from 1972? And this is just the beginning! Actually, we made a lot of headway in just two days! Other than my studio, we have pretty much trashed, donated, sold or given away most of what we don’t want to take to the Squash House. We decided once we get over there, we’ll probably have another big garage sale like we did last summer and that should pretty much put us on track for a much more minimalistic lifestyle! Yesterday afternoon I finally had to take a break! And the best way to do that? - why not make some more Winter Wonderland blocks! 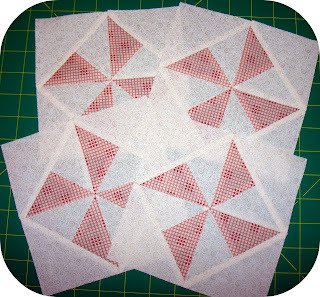 I didn’t have much time, so I skipped ahead to block #5, Pinwheels. They were all made from the same fabrics, so I cut them in no time and power sewed! And speaking of pinwheels - have you seen this design from Crabapple Hill Studio? I have no idea what draws me to Meg’s patterns, but I do love them! Also, have you seen this new fabric line by Sandy Gervais over at everyone’s favorite fabric store The Fat Quarter Shop? It makes me happy just to look at it! I think fabric for an apron and a table runner will find it’s way to me in the near future! Don’t forget to go over to this post and leave a comment about where you would like to be in winter for the Whirl Into Winter giveaway! Love your block work but that's nothing new. (big fan) And Candace, very fun to see what fabric line is making you happy today. I enjoyed that. I did that last summer. Dejunked the house. I can't believe how much stuff we had. We are planning on selling and building, hopefully in 2010. Love your pieced blocks as usual. I cleaned out kitchen cabinets Saturday and it felt so good to get organized again. Shame it doesn't last very long. I have a question...have you or anyone out there bought fabric from connectingthreads.com? I just received a catalog and looked at the website and they look beautiful but wondered if the quality was good. Love the pinwheels. They are great. And I love that quilt - white is so wonderful. And with a little color thrown it it really makes a statement. I hate moving. Poor you. I know just what you mean. Thanks for your sweet and thoughtful comments to me. You're fabulous. i love pinwheels...all pinwheels. there's just something happy about them. decluttering feels good...it starts in my house as the xmas decor comes down. good for you, pairing down instead of moving it all.